With a future as a blacksmith before him, Pip is invited to the home of the lonely spinster, Miss Havisham, abandoned on the day of her wedding. Encouraging her adopted daughter Estella to break the young boy’s heart, Pip is sent there for her own entertainment. The young boy’s fortunes change when an unknown and generous person pays for Pip to travel to London and begin a new life as a gentleman. 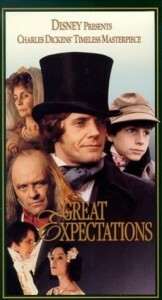 Starring Kim Thompson (Emmerdale Farm, 1408) as Estella, Jean Simmons (Spartacus) as the haunting Miss Havisham, Anthony Calf (New Tricks) as Pip and Anthony Hopkins (The Silence of the Lambs, Thor) as Abel Magwitch, this Disney adaptation of the Dickens classic features many Kent locations. Filming took place at Harty Church on the Isle of Sheppey in Kent: young Orphan Phillip (Pip) Pirrup, on a visit to the graves of his parents, meets the sinister escaped convict Abel Magwitch. The church has part-Norman origins and is visited by both tourists and historians from around the world. The crew also came to Upnor village to film, which provides the home of Herbert Pockets’ fiancée Clara’s house. Locals to the area will notice the Upnor Lighthouse as Pip docks in the village. Another Kentish church, St James’ church in Cooling, which is situated on the marshes near the Hoo Peninsula, inspired Dickens so much, he used the location for the dramatic scene where Pip meets prisoner Magwitch. This entry was posted in Filmed in Kent and tagged Chatham, Great Expectations film locations, Harty Church, Rochester, TV Drama, Upnor village. Bookmark the permalink.